Preliminary ProceduresRemove the transmission range selector lever. 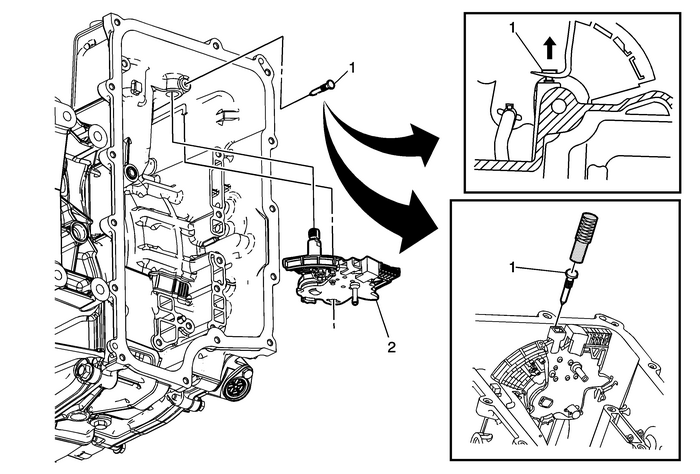 Refer toAutomatic Transmission Range Selector Lever Replacement.Remove the lower control valve body. Refer toControl Valve Lower Body and Upper Body Replacement. Use a small nail puller to remove the pin. Discard the pin. It is not reusable.Use J 41229 manual shaft pin installer to install the pin. Inspect that the pin installed height is within 6.5-mm–7.5-mm (0.25-in–0.30-in). ProcedureRemoval: partly lower the manual shaft detent lever assembly (w/shift position switch)in order to rotate the detent lever and disconnect the park actuator rod. Then fullyremove the manual shaft detent lever assembly from the transmission case.Installation: partly install the manual shaft detent lever assembly (w/shift positionswitch). Rotate the detent lever and connect the park actuator rod. Then fully installthe manual shaft detent lever assembly in the transmission case.Lubricate the manual shaft with automatic transmission fluid (ATF) to prevent damageto the manual shift shaft seal. Tip:Do not pull the park actuator rod end out beyond the machined oil passage surfacein the case. A no park condition will exist if the park pawl actuator assembly ispulled out of the transmission too far and the actuator rod disengages from the parkpawl. The transmission assembly will require disassembly to re-install the actuatorrod over the park pawl.